1. Wash the zucchini and trim the ends. Coarsely grate the zucchini and place into a colander in the sink. Combine zucchini with salt and let sit for 10 minutes. Squeeze out as much of the moisture in the salty zucchini mixture as possible, using a cheese cloth or clean kitchen towel. 2. Toss the semi-dry zucchini mixture into a large bowl, then stir in the remaining ingredients: flour, egg, onions, garlic, cheese, and pepper. 3. Heat the olive oil in a large skillet over medium-high heat. Once the oil is hot, use a large spoon to scoop a few 3-tablespoon mounds of the zucchini mixture in the pan and flatten the tops with a spatula. Do not crowd the pan. Let them cook until the edges are golden brown, about 3 or 4 minutes, then carefully flip each one over and cook for another 2 minutes. 4. 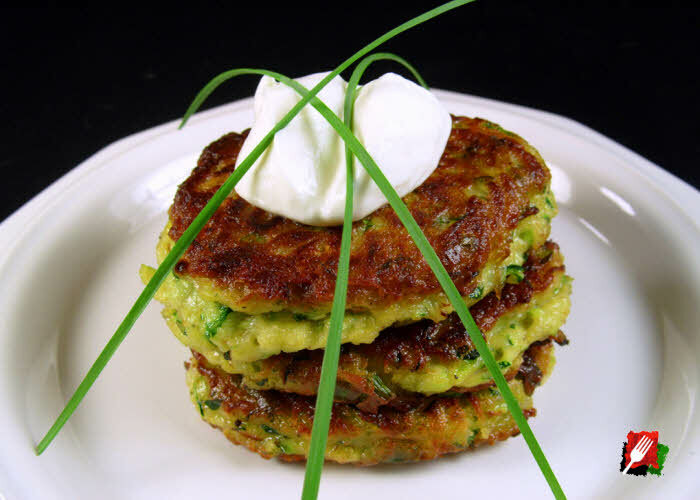 As each batch of zucchini cakes are done, drain briefly on paper towels, then transfer to a baking pan and keep in the oven at 200°F until all of the zucchini cakes have been made, then sprinkle with a little more salt to taste, then plate the zucchini cakes with a topping of sour cream and chives, with a lemon wedge on the side.